A fresh attempt to restore devolved government in Northern Ireland will begin with new talks next week between the DUP, Sinn Féin and the other main political parties in the North. The talks were announced at a joint press conference given by Northern Secretary Karen Bradley and Minister for Foreign Affairs Simon Coveney. The talks will begin on Wednesday. Mr Coveney said the parties will be given weeks rather than months to restore the assembly. "I think we're talking about weeks rather than months here... We're very conscious of the time pressures here and I think all parties recognise that," Mr Coveney told reporters when asked if the parties faced a deadline when talks begin. Ms Bradley said one last opportunity to reach agreement remains and if that does not happen they are facing political consequences that will represent a significant setback to progress in NI since the signing the Good Friday Agreement. She said without rapid progress the UK government will face decisions on budgets, MLA pay and the prospect of a further election. Speaking on RTÉ’s News at One, Mr Coveney said that a lot of progress has been made in addressing disagreements between the two main parties, the DUP and Sinn Féin, over the last six months. He said the policy gaps and points of difference between the DUP and Sinn Féin have narrowed significantly and only a "relatively small number of issues" now need to be accommodated. He said that all parties will have to have a say in order to get a fully inclusive and devolved government in Northern Ireland. Mr Coveney said that hopefully the talks can move the process forward to see a new functioning Stormont Assembly and devolved government. He said that "undoubtedly" there was strain between the Irish government and some Unionist parties in the lead up to Christmas due to Brexit talks. He said not everyone agreed with the Irish position, but he has made it clear of a need to work with all parties in Northern Ireland. and especially the need to have a working, professional relationship with the DUP. 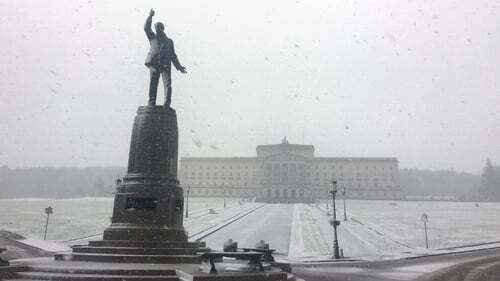 A sense of deja-vu surrounds the announcement of fresh talks to restore power-sharing at Stormont, the leader of the SDLP has said. Colum Eastwood said while he welcomed the new talks process, it must be different to the process of the last 12 months. "We will give it (the talks process) a fair wind. But I would not criticise anybody for thinking this was deja-vu and asking the question 'what has actually changed?"' he said. Mr Eastwood added: "We have a very high standard to try to reach to make sure this process is actually successful. This is about trying to find government that can deal with the challenges we face. "This just can't be the same as we have had for past 12 months because that has been utter failure." UUP leader Robin Swann said the talks process needs to be open and transparent. "This process should not repeat the mistakes of last year, excluding other parties and letting the process drift along. "It needs to be open and transparent so that all the political parties are aware of just how close, or not, Sinn Féin and the DUP came to agreement last year. "We need all the cards on the table and we need to see what the DUP and SF have agreed to date and what differences still remain," he added. Alliance leader Naomi Long said an independent talks facilitator should be appointed. "The appointment of an independent facilitator would be another significant step forward and we are disappointed that has not yet happened," she said. "Alliance first raised this matter before last summer and we were told there was no time for someone to get across the issues which were close to resolution," she added. "Seven months later, we are no further on and rather than waste further time, a facilitator should be appointed immediately. "If we are to have a successful talks process with a sustainable deal, an impartial chair will increase that likelihood dramatically."